20 years ago, people asked for your phone number for contact. 10 years ago, people asked for e-mail to contact you. Now everyone must have an email address, and a web site. Just for the past few years, everyone were asked for a blog address. Blogger, one of the first free blog web site, provides free blog space for everyone who want to write up something. Most of people are writing something for themselves or families to share their photos or life. A free service is good, but it lacks freedom. Blogger has been a number one choice for spammer to create dummy pages for marketing and SEO (Search engine optimization) purpose. So a lotof people don’t visit them anymore. Now WordPress is number one blog system that gives you more freedom to blog the way you want. Of course, Blogger.com gives a lot of flexibility to do thing you want. WordPress gives you more control. It also has huge communities to support new features and plug-ins. There is also a free WordPress services at WordPress.com. Again, free doesn’t means freedom. So it’s better off to setup your own WordPress and host on your own. So how do you convert your Blogger.com blog into WordPress? First of all, you need to make sure you have WordPress 2.2+ installed. You can download it from WordPress.org. The earlier version doesn’t support Blogger import. Let’s assume that you have customize your WordPress 2.2+ the way you want. And you just want to import the blog posts. So here are the process. Open your WordPress admin section and go to Manage tab. There is an import option. You should see the Blogger option. Before you can import any post, you need to make sure you have a Google account that is used to login to your Blogger.com. If you are using the old blogger.com layout with your own email address. You will need to first convert to the new Blogger.com account with a Google account. It’s free to get Google account, which can be helpful for your blogging life. You will be asked to authenticate your new WordPress blog to access your Blogger.com account. If you have not login to Google account, it will prompt you to login. It will ask you to grant access to your Blogger.com account from you WordPress. Once you successfully login into Blogger account, you have the choice to import your blogs. 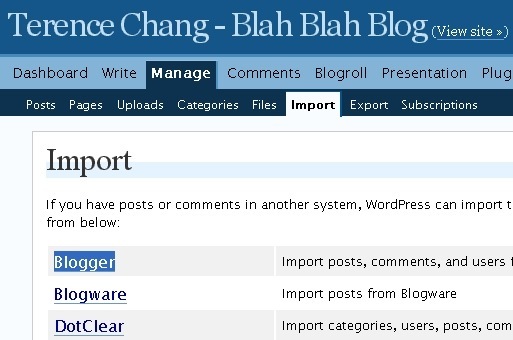 If you have more than one blogs, you can import them one at a time. It will notify you that how many posts have been import to your new WordPress blog. Now you have most of your posts in your WordPress blog. Well. There are problems with this import process. So you have a lot of work to do to clean your blog. 1. It will not import the images from your blogger.com. It will reference the image. It’s not safe to use Blogger.com to store you images. So you will have to manually upload your image to a new photo sharing service such as Photobucket.com or AOL Pictures. I personally recommend AOL Pictures with unlimited space for free. 2. It will import all your tags as categories. So suddenly you have tons new categories import to your WordPress at the top level. You will have to manually change them to make it more meaningful. 3. It will not import your comment correctly. The link in the comment may get lost. I don’t really pay attention on this, since all posts will be treated as new posts on your WordPress. It will be re-indexed by search engine. 4. It will not import your sidebar links, widget, add-ons, css and layout. So you will customize your layout in WordPress, which you have the freedom to do whatever you want. Playing with WordPress is fun and time consuming, if you want to make it looks awesome. There are a lot of resources on the Internet that you can find to help you make your WordPress blog a success. Few more thing you need to do. 1. Install WordPress plug-ins to enhance your blog. Here are some of the Plug-ins that Clazh recommends. 2. Customize your layout to make it simple and clean. So it’s easy for reader to read. 5. Install Google Analytic to track your blog traffic. Hi Beharry, blogs are not WYSIWYG, you need a little knowledge of HTML. Although, there are lots of widgets available which can be of help to people who don’t know HTML. All you need do is add the widget, then drag and drop it in whereever position you wish then view your blog. Pls i need full steps on how to create a [b]mysite.blogspot.com[/b]! ADMIN pls i badly need it.